Happy Three Cover Thursday! Kerry's last Back to School Challenge for the month is Arithmetic. Simply put, use numbers somewhere on your card. Keeping with the BTS Theme, I also used the First Grade stamp from Paperbag Studios for my focal image. The image is stamped in Black on White card stock, then I colored some of the images with markers, and sponged Soft Suede ink on the edges. I layered this onto a Faux Filmstrip Black panel. To create the Film Strip, I used the Spiral Punch. 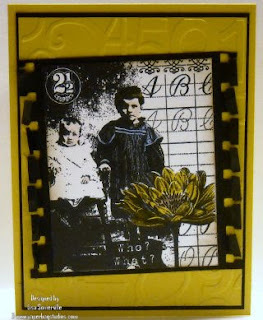 The Crushed Curry panel was embossed with the Big Shot using the CuttleBug Numbers Folder. Looking for more inspiration? Be sure to click on the Three Clovers Thursday logo on my sidebar, to see what the other challenge members created. Be sure to stop back tomorrow - not only will I be sharing my Bloggers Challenge card for the week, I'll be sharing creations made with the beautiful new September Releases from Kitchen Sink Stamps! You won't want to miss what I have in store - see you then! Just beautiful! Amazing detail on that stamp, luv it. Great card Lisa...I like how you colored in parts of the image (sort of like an old photograph). Very Vintage looking. I like your use of CC. I don't usually like that color but you pulled it off well. Awesome card, Lisa. Love that image and what you did with it! I really like this card- it is going to end up in my CASE file with your Route 66 card that I have CASEd as well! I love the film strip technique- and I am surprised- the CC is usually not appealing to me, but I really like it here. TFS! You never cease to amaze me!! Love this vintage-y stamp! Keep on ROCKIN' GF! This is really fun! I love the "faux" filmstrip! Great card Lisa. Your work is always amazing!